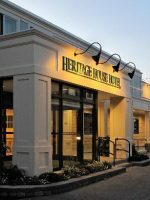 Overlooking Hyannis Harbor, this year-round hotel is the only waterfront hotel in Hyannis. Nearly every room offers excellent views of the marina and harbor. Guests can walk to several nearby restaurants and shops and to either of the two ferries that go to Nantucket and Martha’s Vineyard. The outdoor pool overlooks the harbor and fire pit area. The breakfast room and Lewis Bay Library sitting area also overlook the pool and harbor. Families will love the spacious and unique guestrooms with high ceilings, balconies and small kitchenettes. The Anchor In Hotel has 42 guestrooms, including seven unique executive rooms named after the seven villages in Barnstable. All of the guestrooms offer a mini-fridge, DVD player and bathtub in the bathrooms. Each guestroom is unique in its own way and while booking a reservation online is available, visitors may prefer to call when booking a reservation if you are seeking more information on a specific room. No rollaway beds are available, but cribs are available for a fee. The standard guestrooms feature either a queen, king or two double beds. A small desk and DVD player can be found in these rooms, which feature pool or harbor views. The deluxe guestrooms also feature either a queen, king or two double beds along with an outdoor deck that overlooks the harbor. The seven unique executive guestrooms each differ in dÃ©cor, style and layout. This spacious room features two queen beds and a sleeper sofa along with a wraparound balcony that overlooks the harbor and pool area. This large guestroom features a king bed and large balcony with several chairs and a table with an umbrella. A kitchenette area features a small dining table, mini-fridge, sink, microwave and plenty of counter space. There is no sleeper sofa in this guestroom. These nearly identical guestrooms feature two queen beds and a sleeper sofa, along with a balcony that overlooks the harbor. A small dining table can also be found in these guestrooms. This large guestroom features a king bed and spacious living space with chairs and a sleeper sofa. A kitchen can be found in an alcove complete with a mini-fridge, microwave, sink and lots of counter space. The very large walk-in closet can also easily double as a baby's room as it can nicely fit a crib. French doors lead to a deck overlooking the harbor and sky lights in the slanted ceilings provide even more light. This guestroom is really two separate guestrooms that are often rented together. It boasts a separate entrance just for these two rooms, which are situated at the top of a stairwell on either side of the stairs. One guestroom features two double beds, a couch and a kitchenette with a mini-fridge, microwave, sink and small dining table. The second guestroom features a king bed and no kitchenette. A balcony is situated off each room. First time at Anchor In & it was great! Comfortable beds & pillows, bathrooms were clean & well stocked with towels (I do not like requesting extra “stuff” when ample quantities are not provided—not the case here —all bathroom necessities amply stocked! ), mini fridge & safe. Shower pressure great! ...and odd thing to mention but the lighting was fabulous. So many options in the room including dimmers-that was really handy. Rooms were cleaned meticulously everyday. It was nice to have a little deck to overlook the harbor-view was good. Breakfast included everyday - Plenty of choices. Fruit, French toast, cereal, bagels ...all standard fare and great to get the day started. Our kids were happy with the selections too :) added touch-hot chocolate in the evening for the kiddos (coffee for adults). Loved this. The staff was equally wonderful. Everyone was accommodating & helpful. The only things that require improvement are the wi-Fi & perhaps the TV in the room (can’t stream), but that didn’t deter much from our lovely visit. Would stay again. Once again, a great stay at this hotel from welcoming and accommodating front desk staff till efficient check-out. Double queen room with desk, easy chair, good lighting and small frig with coffee maker on separate counter added to the overall cleanliness of the room. Bathroom is small with limited counter space but ample towels. Large TV with DVD player still just analog giving fuzzy pictures - update to HD already to enhance the stay. 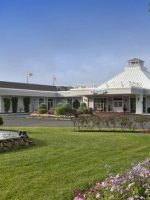 Extended continental breakfast with eggs, ham, cheese, bagels, cereals and plenty of fresh cut fruits included in room rate as is on site well lit parking. As a repeat visitor we enjoy seeing most of the staff again as they make the difference in hospitality. 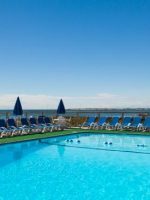 The large, heated outdoor pool, with a depth of about 3 to 8 feet, overlooks the marina and Hyannis Harbor and is surrounded by lounge chairs. The seasonal pool is open from 9 a.m. to dusk and pool towels are provided. 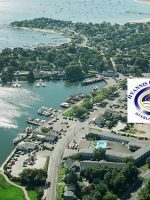 The hotel overlooks the marina and Hyannis Harbor, where numerous boats can be seen. There is a small boardwalk pier guests can walk along to get an even closer, too. A fire pit surrounded by chairs also overlooks the harbor and can be found directly below the pool on a pretty patio area. The Lewis Bay Library is a cozy spot with summer beach colors that has a television hanging over a fireplace and lots of cozy chairs and small tables. Families will enjoy playing any of the board games available to guests or reading any of the books. The library opens up to the glass solarium sunroom area, which offers excellent views of the pool, marina and harbor. A small beach is located about a quarter mile from the hotel and guests can easily walk. Kalmus Beach is about 2 miles away. Complimentary breakfast is available off the Lewis Bay Library in a gorgeous bed and breakfast-style galley kitchen from 7 to 9:30 a.m. The deluxe continental breakfast includes things like cereal, muffins, yogurt, ham and cheese and hard boiled eggs. Guests can enjoy breakfast in the library, outside by the pool or in the glass solarium just off the library which overlooks the pool area. Or guests are welcome to take their breakfast back to their room. Throughout the day, guests can find fruit, coffee, tea and cookies in the kitchen area, as well. Free parking in a large lot is available to guests. This year-round hotel is at its busiest from about April through October. 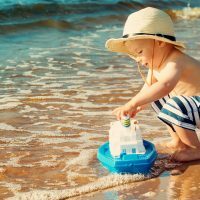 July and August are the peak season but the fall months also bring many visitors to Anchor In Hotel when the rates are lower. Anchor In Hotel is located in the town of Hyannis on Cape Cod. It is also the only waterfront hotel in Hyannis as it overlooks the Hyannis Harbor. 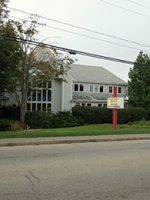 It is about 90 minutes to Logan International Airport in Boston and about one hour to Provincetown. Families will find it convenient to walk or bike around town as Main Street is only a block away. Walking to the ferries (to both Martha's Vineyard and Nantucket) and beach is also possible. If you plan to venture outside of town or to other places along Cape Cod, a vehicle is needed.